Liversedge suffered a 5-1 defeat away to Albion Sports as they continue to struggle in the Northern Counties East League Premier Division. Liversedge are in the middle of a horrendous run of away fixtures as they have not played at Clayborn since beating Barton Town Old Boys back on October 31. They are not due to play at home until Cleethorpes Town visit on January 5, by which time it will have been over two months since they trotted out on their own midden. Sedge have submitted an application to Sport England for funds to carry out additional drainage works on the pitch under their ‘preservation of playing fields’ grants and a decision is expected in February. 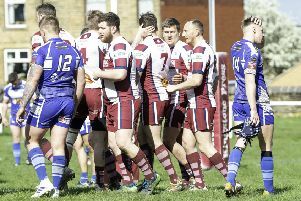 Clayborn is the only floodlight football pitch in the Spen Valley and the club see securing the funding as crucial to increasing the number of matches played at the ground. Liversedge only trailed 1-0 at half-time at Albion Sports following Jordan Hendrie’s goal after 30 minutes. Antony Hilton equalised straight after half-time with his first league goal of the season but just a minute later Marcus Edwards restored Albion’s advantage. Liversedge’s task became even greater as Omar Habib made it 3-1 after 53 minutes and Edwards then put the home side out of reach with his second goal. Habib also completed his brace seven minutes from full-time as Liversedge slipped to a 13th defeat of the season. They are third-bottom, just a point above Parkgate and five ahead of bottom side Brigg Town ahead of Saturday’s trip to Barton Town.